You’re up early drinking your first cup of coffee and wondering whether today would be a good day to spray Justin’s Home field. You check your iPhone and your Climate app tells you the field got 0.3” of rain in the last 24 hours. It’s just around the corner so you walk out and double check the rain gauge. When you get there it shows 0.8”. Hmmm, that’s a big difference. You sigh and look skeptically at your Climate app. Why are precip measurements in Climate Basic™ sometimes exactly the same as your rain gauge and sometimes totally different? The answer is that we’re measuring and comparing different things. And the difference is subtle but important. Your rain gauge records the precipitation for the few square inches of your field that it covers. But as a storm passes over, the intensity of rain can vary enormously from one side of the field to another. You will often get different readings depending on where you put your gauge. For example, that patch over by Justin’s house gets less wind and less rain than the corner up by the road. CocoRaHS has some good tips on how to best set up a rain gauge. Climate takes a different approach. We provide a precip measurement for your entire field. The way we do this is by taking live weather data feeds from various sources, including weather stations, radar and satellites. These data feeds come as an average precip measurement for a grid of roughly ⅓ of a square mile. We then match those grids up to your fields. We receive our first estimate of precipitation 15 minutes after the hour. Then, as more data is received, we update the readings with additional quality-controlled values. This is why you’ll sometimes see our measurements change over time. Why do we report a whole field measurement? Often times your rain gauge can capture a particular storm effect at a single point. In addition, there are many reasons why gauges often give you inaccurate readings. For example, your rain gauge will report less rain if it’s windy or you just forgot to empty it yesterday. Our approach relies on many sources of information to help prevent such inaccuracies. But it also means that our precip records may frequently differ from what you see on your rain gauge. There are benefits of monitoring both Climate and your rainfall gauge. 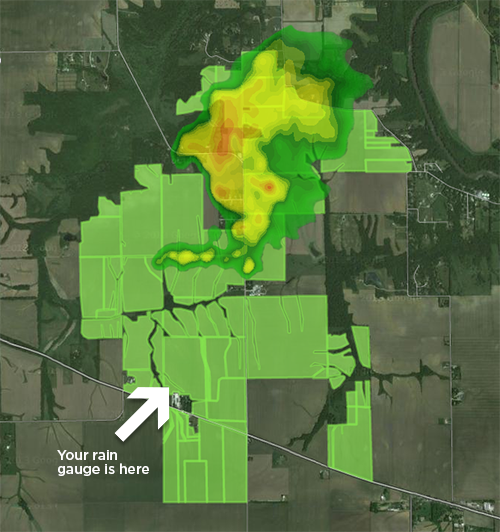 Looking at whole field precip will help you understand the varying workability of your fields. It also tells how your fields are trending over the season – too wet, too dry or just right. What improvements are we working on? Does that mean we can’t do better? Absolutely not. We’re hard at work on various ways to improve these measurements. By incorporating as much data as possible from multiple sources, we aim to provide you with the most accurate and timely precip records and weather forecasts, day in and day out. In the meantime, if you’d like to register your rain gauge and submit readings on a regular basis for comparison with our measurements, simply fill out this form to get started, and we’ll be in touch. We’ll also be writing more about the science behind rainfall measurements so subscribe to our blog to get the latest updates.